Helping established churches renew and new churches start. to help GCI-USA churches start, renew and relaunch. To help fund CMM’s ministry, click here. by providing various services, including the two consulting services detailed below. Through TC consulting, CMM helps congregations develop the seven characteristics of churches that participate actively in what the Spirit is doing to transform the lives of individuals and communities. 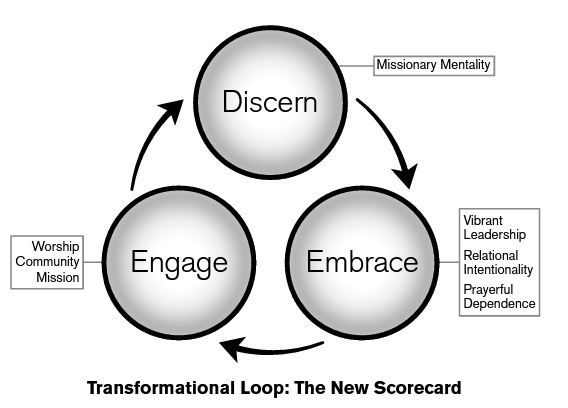 Those characteristics make up the Transformational Loop shown below. Research indicates that all seven are strongly present in churches where people are encountering Jesus, choosing to follow Jesus, and growing as co-workers with Jesus. 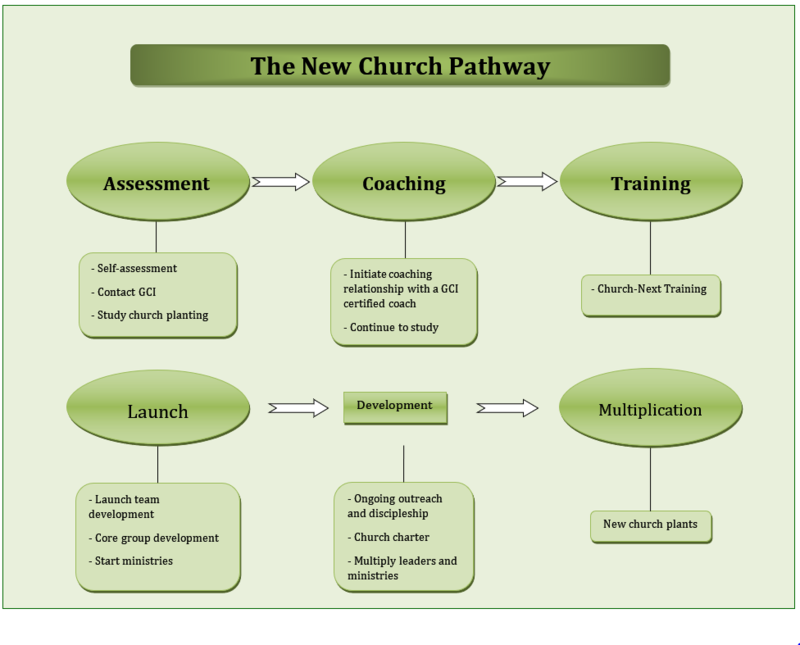 TC consulting include the following elements: 1) a church-wide assessment using an online assessment instrument, 2) a day-long interactive Discovery Retreat, 3) formation of a detailed action plan that defines the congregation’s journey forward, 4) follow-up ministry coaching for the congregation’s lead pastor. TC consulting is provided by GCI-USA trainers certified to use LifeWay’s Transformational Discipleship Assessment tools. For an issue of GCI Equipper devoted to transformational church values and resources, click here. For videos addressing TC consulting, click here. For articles about two GCI congregations that have received TC consulting, click here (Dallas, TX) and here (Big Sandy, TX). Through the three support services listed below, CMM helps new churches navigate The New Church Pathway (for details, click on the links, for related resources, scroll down). Assessment—helping new church team leaders confirm their calling to start a new church. Coaching—providing ministry coaches to give new church leaders relational support and accountability. Training—providing Church-Next training to help new church teams start, develop and multiply their churches. Here are resources that address starting new churches and related issues. What Does a Church Planter Look Like?